Eckhard Binding has been hailed as an example, and even a hero, in SA and around the world. It may be a bit of a stretch. When I saw the Eckhard Binding video yesterday morning I reacted, at first, like I imagine most people do, with disgust. It looked like an appalling scene. 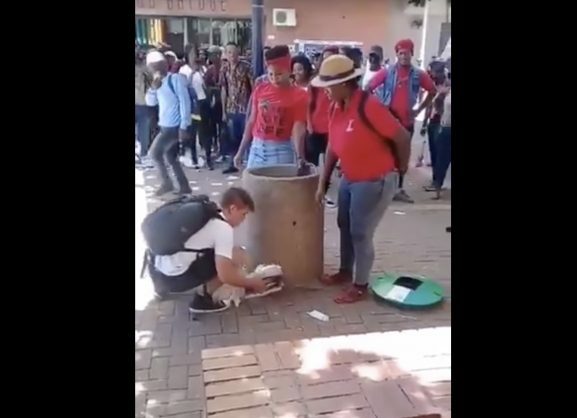 Here was some white guy just trying to clean up some litter, and here were two women in EFF outfits, tossing his picked-up litter out of the bin as soon as he tossed it in. He just kept picking it up though, and they just kept tossing it out. It looked like classic bullying and the EFF looked bad. Very bad. This is really not cool, I thought. And by the way, what is going on here anyway? I soon learnt that the footage was from a protest at the University of the Free State last week where a group of people, including EFF members, were demanding the insourcing of staff on campus, which has been a cry of the Fees Must Fall movement for some time now, among many other things. The protesters had trashed the campus, as they often do (with predictable, mind-numbing regularity each year). Binding told The Citizen yesterday he’d even had a chair tossed at him, coincidentally and allegedly, by one of the women standing at the bin in the clip. Violent protests are rarely good. But there is a perception that has been encouraged in this country that the only way you can get people in power to listen to you is if you burn something down or wreck it in some way. Sadly. We know, logically, that the people destroying their infrastructure are only hurting themselves. When they torch their community library, smash out a Rea Vaya bus stop, set fire to a school and so on, they are only messing up their own neighbourhood and facilities, setting back the chance of service delivery, when what they are crying out for is improved service delivery. However, when they do perform such acts of social self-mutilation, they get a momentary bit of media attention and maybe a government official or two hear them out for a few minutes. I suppose, much like the suicidal person who cuts him- or herself, these protests are a cry for help. It’s not logical; it happens anyway and, yes, it is beyond tragic. This culture of violence has permeated the way young people protest when they get to university, because often they have witnessed it done in their communities for years growing up, and it’s the norm. It isn’t great, but that’s the way they think the game is played; hopefully one day we’ll mature out of it. As for the background of the young man, Eckhard Binding, I don’t know him and can’t speak for him, but I can for myself. He and I could have similar backgrounds. I attended the same university in Bloemfontein where the protest happened. I never litter. I find litter repulsive. It offends me, and I judge people who litter. It’s my upbringing. Hell, I remember once as a small kid thinking I was impressing a girl, Cynthia (who I had a crush on at school) by spending my entire break period picking up litter on the school field – she didn’t notice and didn’t care, because I doubt she was even aware I existed. But that was just me, and was hardly the weirdest thing about me as a kid. So on a fundamental level I get where Eckhard Binding was coming from with his litter statement, and this time people did notice him picking up all that litter. Maybe even a girl. However, I’ve since had more time to ponder the whole thing and can’t help but find myself rejecting the narrative that we should be treating the young man as a hero, or even as the victim, in this story. Apparently the clip has been viewed millions of times already, and all over the world. He’s had offers of donations from Canada, the USA, and other developed-worldy places (if Cynthia is one of those people, I’m going to be p*ssed off). He’s also been offered a bursary. Nobly, he’s undertaken to have all the money put into a fund for an initiative he hopes will get people to talk to each other more. But here’s the rub, at least for me, and why watching that clip now makes me uncomfortable. You can’t escape the fact that although he has said, and certainly believes, that he was trying to “set a good example”, Eckhard Binding was actually weaponising something as simple as litter as a passive-aggressive act of provocation (please bear with me here, and read till the end if you’re now feeling angry). Here was a group of people engaged in a protest, and feeling confident, rightly or wrongly, of the merits of their cause. And here, in the middle of it all, along comes a white guy who starts cleaning up their statement of dissatisfaction (which is what the litter meant to them) right in front of them. I imagine that when he picked up his first bit of litter and tossed it in the bin, the EFF women just tossed it out instinctively as a rejection of what he was trying to do, which may have come across as trying to seem like the superior person … the “better man”. Well, they couldn’t back down now, surely. So they tossed it out again. And he picked it up, again. And they tossed it out, again. And so the pantomime played itself out rather absurdly, with neither “side” willing to back down. I’m not sure how it all ended, and I really don’t care. When you’re seeing people protesting, as an ordinary civilian you are faced with limited choices. You can either join them if you like their cause, you can stay clear of them, or maybe just decide to jeer at them from a safe distance. If you want to get involved and stop what they’re doing, I would advise you to join the SA Police Service and – after a few years – be trained in public order policing, which will allow you, perhaps, to fire a water cannon at the people. But failing that, you should probably just stay out of their way. Jumping in and cleaning up their mess while they’re in the process of creating it will probably just get you hurt. It’s not advisable. If Eckhard Binding was so worried about the litter, he could have just waited until everyone went home and then had all the time in the world to pick up all that trash to his heart’s content. It would also have set an excellent example. But that wouldn’t have suited the message he was trying to convey. Eckhard Binding was registering his own protest at the campus being trashed, and that’s what there primarily was to it. I must say I was surprised when I heard the audio from his interview today, because he came across as an intelligent and well-spoken young man. I had already come to the conclusion that maybe he was a dimwit, which was one of the first ways I’d made sense of what was going on there. Maybe this guy just didn’t understand why all that litter was strewn about, and was trying to do as he’d been told by his parents, which was to pick up the rubbish like a good boy. If that was true, and he had a low IQ, or however you want to put it, then the EFF were being even bigger villains about the whole thing than we realised, and picking on someone who deserved protection. But Eckhard Binding admitted openly in his interview that he had felt “hate” while what you saw in that clip was going on; while he was trying to set his “good example”. The only people I had previously thought picked up litter with hatred in their hearts were characters in those American chain gangs you see doing community service in movies. I do understand why people have been inclined to hail Eckhard as a hero, because he was showing up the EFF, a party for whom many have serious antipathy. I get that. I’m not crazy about them either, not least because their policies are absurd and they take their thuggish cues from the character of their leader. But nevertheless, there are no heroes in this story. So go ahead if you still feel like donating money to Eckhard Binding and whatever he’s trying to achieve. I won’t be.